June 22: Please pray that God will calm my nerves and help me to stay focused on the things that I need to finish before leaving on the 2nd. 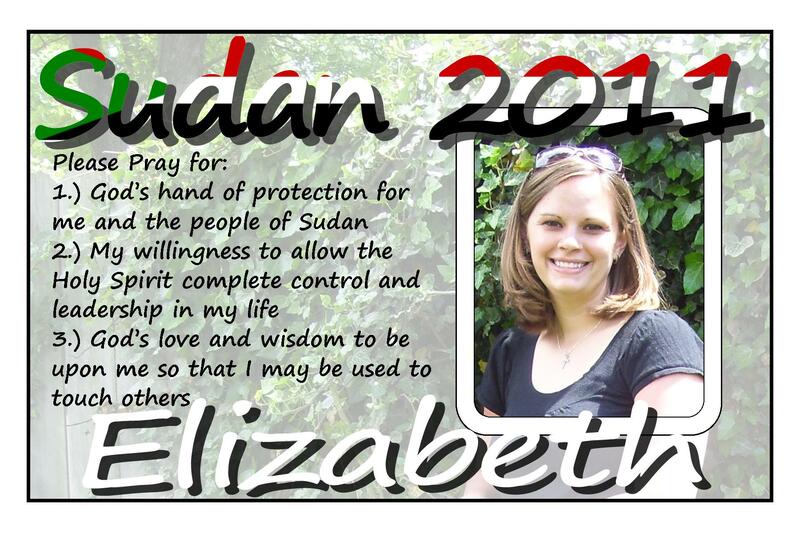 July 2: Please pray for my safety over the next 36 hours as I travel to Sudan. Please pray that I will quickly connect with and form a good relationship with Steve and Diantha. As I am serving His people, ask God to continually remind me how much He has given me and how much He loves me. July 5: Praise God for protecting me on my long journey to Yei. I am thankful that I was welcomed here so warmly! Praises that I have been able to recover from jet lag so quickly. Please pray that my good health will continue and I will continue to connect with and form relationships with the people of Sudan. Pray for continued peace in Yei. Jesus — thank you for blessing me with a dear friend and sister through your family! May the world in which she travels see the beauty her life portrays because of you and how she sees her true beauty. Thank you that her identify is secure in You and that you sustain her every minute. Challenge her in ways in which she will continue to need you and encourage her abundantly when her well is dry. Thank you for loving and giving and inspiring and doing everything that you do to make us happy. Everything you do is such an inspiration, and I am so grateful someone like Ms. Heft has the ability to step out of her comfort zone and spread the good news about all that you have done and do and will do in the world and people’s lives. I pray that she will come across many open doors, both in ministry and in relationships with the people she encounters. I pray that she is protected from all harm and I pray for provision for her travels in South Sudan. I pray that she’ll be able to shine through and be a light to people who are resistant to you and your living word, Lord. I pray that you fill her up with encouragement and strength so that she may continue to be a light to others and that she never questions herself. I pray that she is courageous and bold in her witnessing and in all that she does and she doesn’t let fear or discomfort get in her way of bringing forth change and new life in South Sudan. Give her joy, peace, love, hope, and refreshment when she needs it most. I pray that the people of South Sudan continue to be loving and gracious and open to change, and I pray that they are willing to receive guidance. I pray that they continuously hunger and thirst for you, Lord, and that Ms. Heft will be able to provide them with everything they need to continue to spread your word through their good works. I know you can do this, and I know you are very proud of her in all that she does for you, Lord. Bless her and keep her safe. Surround her with your Spirit and guide her when she needs you. Guide her when she thinks she doesn’t need you. Continue to move in her heart, Lord, and inspire her in new ways to be the change that South Sudan needs. Thank you for everything you do, Lord. Amen.